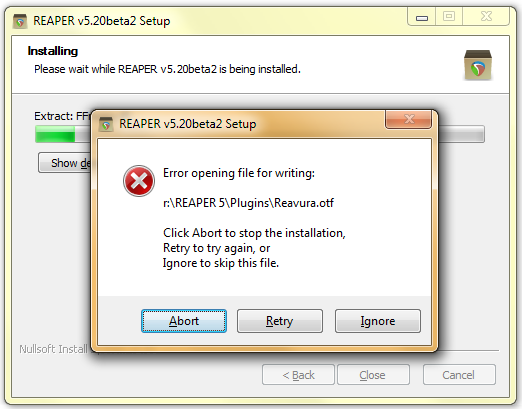 I get this error when installing the 32-bit v5.20beta2 on Windows 7. This is for a portable install, overwriting an existing portable. When I click ignore, it continues as usual. When I tried installing it again, same location, same error happens. Font maybe used by another app? Try closing all opened apps. There are no other open apps. And what other app would be using what appears to be a Reaper-specific (rea*. *) font file located in the plugin folder of a portable install? But it consistently gives that error when installing over my active R5 install folder. 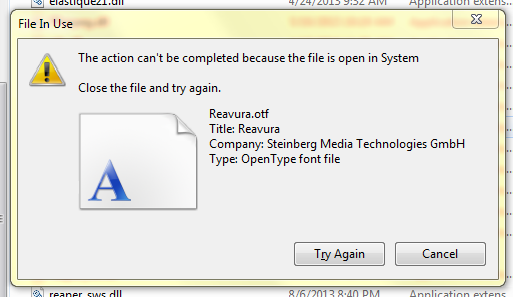 When I try to delete Reavura.otf from that folder, I get an error that the file is "open in System." But what else would be using it if Reaper isn't running at the time? I looked using Process Hacker but it didn't show anything. But when I rebooted, as expected, the file had been released and the install went without problem. But it's odd how the system had been holding on to that one file. Reaper_32.exe was still processing I bet. It started happening to me after 5.17. Some 32bit plugs were the ultimate issue. Might have just been in my case but I think thats what has been causing it for me. Bumping. Still happening with 5.973. Safe to hit "ignore", but making it not overwrite the font unless it changed.